How Crazy A Parlay Would You Need To Win $586 Million From One Dollar? The lottery is not something that any of us are going to win in our lifetimes. I say that not as a pessimist, but as someone who understands the odds that go into it. 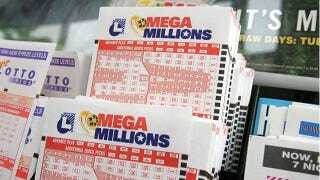 Let's translate the Mega Millions' 1 in 259 million odds into sports betting terms. Specifically, how disgustingly ambitious of a parlay would it take to win the equivalent to tonight's $586 million lottery drawing from a one dollar bet? In order to calculate the disgusting odds that it would take to win $586 million from a one dollar ticket, I used a parlay calculator. These can be found all over the web, and are fun to play around with. Since parlays require all bets within them to win, their odds can skyrocket if you continue to stack more games into it. Here are just a few of the combinations that would win you $586 million from a $1 parlay bet. For reference, you rarely even see moneylines when the underdog would be far over +1000. So, yeah, good luck with that lottery ticket.